Copper has character and offers a level durability and dependability that no other metal roof can match. Its elegant appearance will complement any style of building. Copper has been used for centuries throughout Europe on castles, cathedrals, historic churches, historic government buildings and famous private residences. 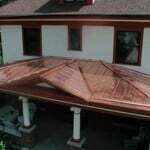 When properly designed and installed, a copper roof provides an economical, long-term roofing solution. 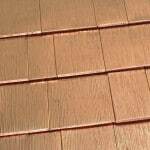 Unlike many other metal roofing materials, copper requires no painting or finishing. Through its natural weathering process the shiny copper roof gives way to warm bronze tones in about a year. Through natural aging the elegant green patina finish will emerge. The time to patina varies with climate, salt and chemical composition of the air and rain. Copper’s resistance to the elements ranks among the highest of modern roofing materials. A copper standing seam metal roof provides a clean, traditional look. Unlike many Standing Seam products which are scaled for commercial applications our Copper Standing Seam roofs are scaled for your application. 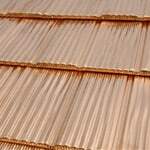 Copper Shake utilizes a rugged texture and deep realistic wood graining to give your roof old world Charm and elegance. This roof design is the most tried and proven design of all metal roofing shingles. With its unique design our “Quick Copper” Oxford Shingle represents the finest copper shingle available. Because of the five foot length of each shingle the installation costs are lowered providing increased value. 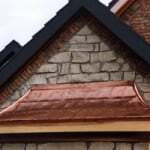 Copper has been widely used to accent bay windows on homes. The shape of the bay is often custom formed to fit the style of the home and personal taste of the homeowner. Our craftsmen, take special care and have years of training in order to create the perfect custom accent for your home.